Chawanmushi (Savory Egg Custard/茶碗蒸し) is a delicate and savory Japanese appetizer that we are familiar with. It is prepared by steaming egg with dashi stock in a small dainty Japanese teacup and filled with ingredients such as chicken, prawns, kamaboko, mushrooms, and mitsuba. I will follow closely to the traditional method in this recipe, but you can freely use other ingredients, or even substitute the dashi stock with chicken stock. The steamed custard is smooth and silky. When you dig deeper, you will scoop up varies ingredients embedded at the bottom of the teacup. It is fun to guess what you will fish out next, as the type of ingredients is highly customizable. I am not a linguistic expert, but Chawan sounds like two Chinese words 茶碗, which means tea bowl. Incidentally, it also means the same in the Malays and Indonesian language. Mushi is steam. That means Chawanmushi can be translated as steam (something) in a tea bowl, or /茶碗蒸 in Chinese. This similarity explains why chawanmushi is so similar to the Chinese steamed egg, which shares the same technique to get the silky smooth texture. Note: This post may contain affiliate links. Please read my private policyfor more info. I may receive commissions for purchases made through links in this post. How to make the flawless chawanmushi. Please take a few minutes to read the following explanation if you want to make the most delicate, ethereal savory egg custard that you ever have. A good stock is the foundation of an excellent chawanmushi. Dashi stock is the common stock for the authentic chawanmushi. However, you can use chicken stock as the alternative as chawanmushi is a very flexible recipe. Do NOT remove the white stuff of the kombu as this is the part with high umami. Place it in the water, soak it for minimum 3 hours minimum (or up to 24 hours). Bring to a boil over low to medium heat. Remove the kombu once it starts boiling. Add the katsuobushi. Heat it up to just before boiling. Turn off the heat. Wait until the katsuobushi sink to the bottom, which takes 2-3 minutes. Strain through cheesecloth or a wire mesh strainer lay with a kitchen tissue. The combination of kombu and katsuobushi is always more significant than the stand-alone individual. You will immediately notice the aroma and flavor that you are familiar with at the Japanese restaurants. You can keep the dashi stock up to 1-2 months in the freezer. Some people make it into ice cubes so that it is easier to remove it from the freezer. According to the chef/owner of Kyoto’s three Michelin-starred Kikunoi restaurant, the best dashi should be prepared by soaking the kombu for an hour at 60°C as this is the optimum temperature to extract the umami flavor. After removing the kombu, the temperature should increase to 80°C before adding the katsuobushi. Never boil the katsuobushi as extracts the unwanted elements. I have simplified its method in this article. You can refer to this article for the art of making the best dashi, although it will take you more time, and required a kitchen thermometer. The egg to stock ratio is critical because it will determine the firmness of the custard. The custard will break if there is too much stock and no longer smooth and silky if it is too little. I made the Chinese steamed egg with three eggs (150ml) and 260 ml of water. The egg to water ratio is 1:1.7. The ratio I use in this Chawanmushi recipe is 1: 2.7, which is much watery than the Chinese steamed egg. This ratio will stretch out the egg to the limit, where the stock and the egg is barely able to congeal, which result in an impossibly silky texture. Any higher ratio of egg to stock than this will cause the custard to collapse, and broken down into curds when you pierce the spoon into it. Since Chawanmushi is served in the tea bowl, you can make it more delicate without worrying that it will break when scooping out. The custard will jiggle when shaken. And when you sink your spoon into the custard, you will see a small amount of dashi exude from the custard. However, it is not the same for the Chinese steamed egg. In this case, each person will scoop the egg custard and place it in their bowl. Hence, it has to be firm to avoid it from breaking into a pool of messy curd on the table. 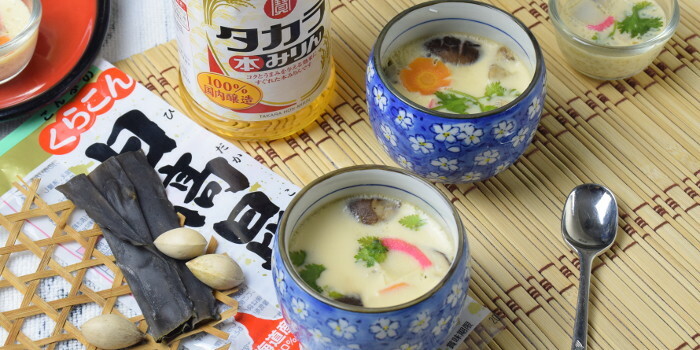 Make your dashi if you want the Chawanmushi to be tasty. The more flavorful the base, the tastier the chawanmushi will be. You may use other stocks as the soup base. 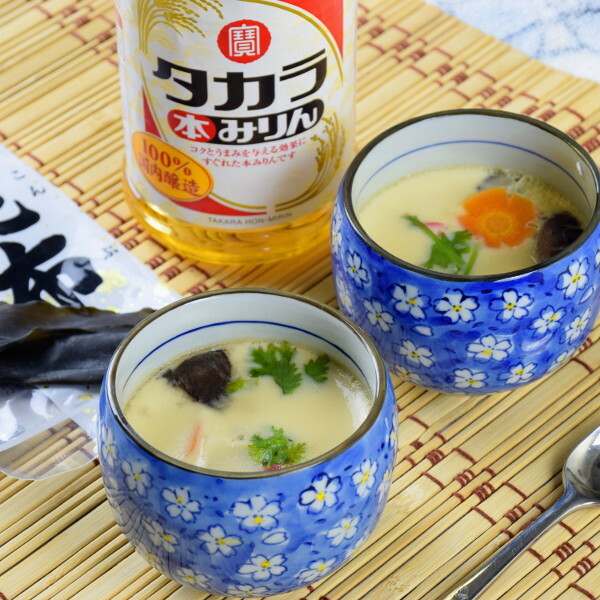 Chicken stock is the substitute If you do not intend to make dashi stock just for making chawanmushi. Another option is to buy the instant dashi. Some of this dashi are flavored. Check the label to find out if you need to add any soy sauce, mirin or sake during the preparation. The filling can be as simple as diced chicken meat and kamaboko (steamed fish cakes), or as luxurious as dried scallops, shrimps, ginkgo nuts, and shiitake mushrooms. You can use either fresh or dry shiitake mushrooms. Presoaked the dry mushrooms if you use the dry type until it is fully rehydrated. Cut the mushrooms into quarter if it is too large, or slice it into strips. Cut a cross on the cap of the larger mushroom as a design. Use either chicken breast or thigh meat, but has to be boneless. Cut the meat into small pieces and marinate with Japanese soy sauce. Lightly pan-fried the chicken until light brown if you want to add a bit of extra flavor. Prawns are the common ingredients you will find embedded in the custard. Clean the prawns, remove the shell, deveined and marinate with some Japanese soy sauce. 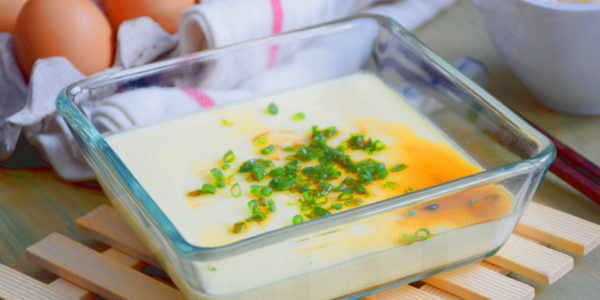 Put the mitsuba (wild Japanese parsley) on top of the custard as it has an attractive shape and flavor. You can use coriander leaves as the substitute. Ginkgo seeds are commonly added into the custard in Japan. Remove the shell by knocking it with the back of the knife. Cut the ginkgo seed into two, and remove seed coat by rubbing it lightly as well as the embryo with a toothpick. Cut the carrot into thin slices. Blanch to soften them. 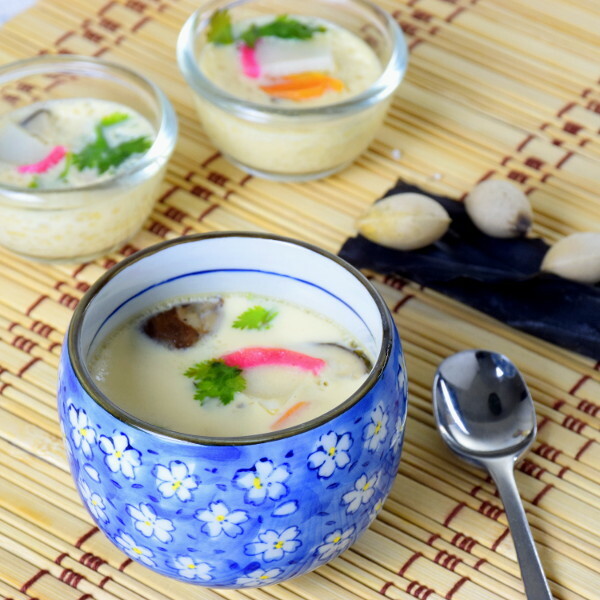 Chawanmushi is a delicate appetizer which, should only have soft and tender ingredients. The duration and temperature of steaming as indicated in the recipe is only a guideline, as actual timing and heat depend on the size of the bowl and the stove that you use. You can refer to an article that I wrote sometimes ago about the Chinese steamed eggs. Over there I have tested several durations and temperature used by the renowned chefs and experts. The same principle applies to chawanmushi as they are all cooked in the same manner. Steam over low heat to ensure not to overcook the custard. Rapid boiling water will cause the custard puff up during steaming and collapse during cooling, leaving unsightly holes like a crater. Do not open the lid during steaming to avoid a sudden drop in temperature that may cause the custard to deflate and collapse. Cover the bowls with an aluminum foil or cling film to prevent water droplets from wetting the custard during steaming. Steam until the egg custard is barely congealed. This texture is formed when the custard quivers if you shake it lightly, and the surface will bounce back when you pressed it lightly with the back of a metal spoon. This moment is when the custard is barely missed its breaking point, which results in the smoothest custard you can have. Stack up the ingredients in the bowl loosely to enable some of them to emerge on the surface. Carrot slice, mushrooms, and mitsuba are colorful which is best to stack on top, while the chicken, prawns and gingko nuts are usually burying underneath. The egg liquid should be beaten lightly to avoid creating too many bubbles. Large bubbles will collapse and result in an uneven surface. Mix the egg liquid with the dashi stock before straining. If you strain the egg liquid first before adding to the dashi, you have to mix the egg with the stock again which will create more bubbles. Straining will move most of the bubbles, catches the strand of egg whites and any other impurities. Us a wire mesh strainer to strain the egg/stock. Fill up the individual bowls with the ingredients of your choice. Fill up the bowls with the egg liquid. Use the corner of a piece of folded kitchen tissue to break any remaining bubbles on the surface (if any) before covering them with the aluminum foil or cling wrap. 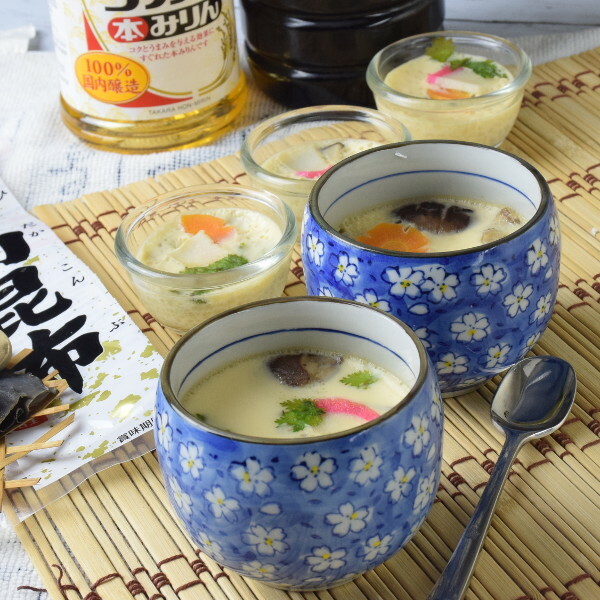 Chawanmushi (Savory Egg Custard/茶碗蒸し) is a delicate and savory Japanese appetizer. Make a few slits on the kombu. Place it in the water, soak it for 3 hours minimum (better overnight). Add the katsuobushi. Baring it back to just about to boil. Add the dashi, salt, Japanese soy sauce, sake and mirin to the egg. Mix well. Strain the egg liquid through a wire mesh strainer. Presoak the dry mushrooms until it is fully rehydrated. Cut the mushrooms into a quarter, or slices. Cut a cross on the cap as a design. Cut the chicken meat into small pieces and marinate with the Japanese soy sauce. Remove the shell, seed coat and the embryo of the ginkgo seed. Cut the carrot into thin slices. Blanch until they are soft. Place the chicken and ginkgo seed at the bottom of the teacup. Fill up the cup with the egg liquid. Place the mushroom, kamaboko, coriander leaves, and carrot carefully on the surface so that they are floated partially. Cover the teacup with the lid, aluminum foil or cling wrap. Steam for 15-20 minutes over low heat with lid-on. Served. 5 replies to "How to prepare Chawanmushi (with step-by-step instruction)"
Thanks for your chawanmushi recipie. Very clear n detail. Thank you for trying my chawanmushi recipe. Hope you will like it. Thank you for your encouragement. I will write, test and upload more recipes. And wish you love the Chawanmushi.